Do you think we're creepy? Some people I know find mannequin heads creepy. I thought it was a necessary investment for my business. 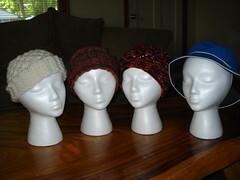 Especially because I seem to have a way with hats. The hat on the left is the surrey prototype. I've done some frogging on it this morning and last night, but I figure it needs to be perfect. I should be back up to the decrease section in no time. 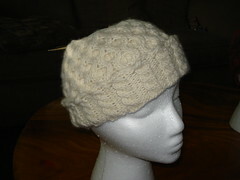 The Misty hat pattern will be published shortly. 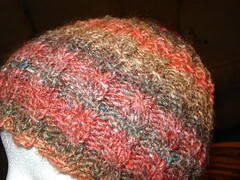 It only takes one skein of Noro Silk Garden or an equivalent and it's a fast, fun, (and will be free!) knit. This morning I've been unusually productive and now I'm off to get my hair cut, which it really, really needs. Maybe I'll have cute pictures of my new haircut later. Eh, probably not.